Artificial intelligence (AI) can be defined as intelligence exhibited by machines or software. Although the quest for AI remains an elusive moving target, there have been undeniably rapid and significant advancements in the fields of computer science, robotics, neuro-engineering, virtual reality, and other areas that attempt to construct intelligent behaviour or imitate and enhance human intelligence. These recent advancements have been matched by vigorous discussions and polemics. A campaign to Stop Killer Robots is ongoing, highlighting the concern that the AI technology enabling autonomous weaponry “has reached a point where the development of such systems is – practically if not legally – feasible within years, not decades”. Many futurists also predict and fear the emergence of a technological singularity by 2045, where the sophistication of AI capabilities will remove any distinction between humans and machines. A less intimidating future – a fulfilment of the Millennium Challenge – is scheduled for 2050, when it is predicted a team of RoboCup humanoid robots will be able to defeat the FIFA World Cup champions. In light of these diverse projections, it is worth taking a few steps back to analyse the evolutionary background of our own species and life itself. The origin of life remains one of humanity’s greatest mysteries, complicated by an apparent chicken-and-egg paradox: how could primordial, self-replicating chemicals have organized into complex genetic structures if these same structures are necessary for replication to occur? An elegant resolution to this paradox was proposed by Alexander Graham Cairns-Smith in 1985: the self-replication of clay crystals might represent the missing link between biologically inert matter and the emergence of organic life. Clay crystals preserve their external arrangement during growth and regrowth; it was proposed that this function could supply the means for initial replication cycles of organic molecules trapped upon a crystal substrate. According to the hypothesis, these trapped organic molecules gradually developed the complexity necessary to independently regulate their own replication, eventually setting in motion the Darwinian evolutionary processes that led over millions of years to all life as we know it on Earth. In the context of recent debates surrounding advancements in AI, a disquieting analogy may be drawn: is humanity simply a stepping stone, much like the clay crystals, catalysing the emergence of a sentient and dominant robot species? In examining this analogy, we suggest tracing the progress of prominent state-of-the-art AI endeavours. Specifically, the RoboCup challenge provides a unique way to evaluate the evolutionary trajectory of both hardware and software systems, allowing us to focus on their crucial distinctions. 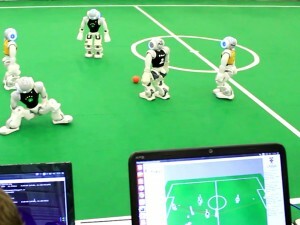 RoboCup – the “World Cup” of robot soccer – was first proposed in 1997 as a standard problem for driving advancements in the fields of AI, robotics and computer vision. It has exploded in popularity in the years since, with recent competitions attracting more than 40,000 visitors and participants from over 45 countries. RoboCup exhibits several characteristics that distinguish it from the previous AI benchmark (chess), namely a dynamic environment, real-time activity, incomplete state perception, non-symbolic sensory data and distributed/multi-agent control. Importantly, RoboCup is partitioned into two complementary endeavours: physical robot leagues, focusing on the development of hardware (fully-embodied AI); and software agent (simulation) leagues, focusing on the development of virtual AI. RoboCup thus provides a unique platform for evaluating the evolutionary trajectory of both hardware and software systems, both of which are necessary to fulfil the Millennium Challenge. The RoboCup simulation leagues have traditionally attracted the largest number of international teams, reaching 40 in 2015. 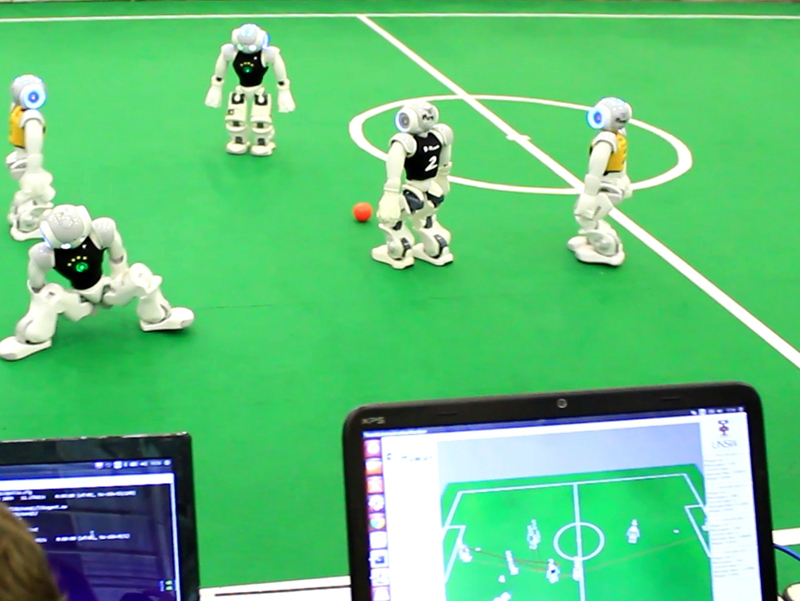 The ability to simulate soccer matches without physical robots removes many hardware and environmental issues (e.g. motor temperature and breakages), allowing teams to focus on the development of complex team behaviours and strategies for a larger number of autonomous agents. The purpose of the simulation leagues was to serve as platforms for the initial development and evaluation of software modules intended for later integration into physical robots. Many of these modules have applications beyond the RoboCup domain, promoting extension and replication by researchers in the wider field of industrial robotics and automation – a multi-billion dollar industry where the ability for a robot to “see”, “navigate” and make “intelligent” decisions is critical to both profit and the safety of human co-workers. Moreover, many novel applications have emerged at the boundaries of seemingly unrelated disciplines. For example, information theoretic models developed to quantify dynamic interactions in soccer games have been applied to better understand swarming behaviour of insects, birds and fish in terms of their collective memory and long-range information cascades. These models have also been applied in computational neuroscience to model the structure and connectivity of the human brain, and to classify diagnostic patterns detected by “electronic noses”. Despite occasional achievements and the best intentions, the adoption of intelligent behaviours (developed for the RoboCup simulation leagues) by physical robots is uncommon and has, arguably, slowed in pace. Why is this the case? One reason is purely economic, as described in a recent study which found that nations with lower educational funding are significantly under-represented in physical robot leagues. Robots are generally expensive to purchase, maintain and transport, imposing a high entry barrier for these institutions and socioeconomically partitioning the robotics research community. The result is a diversified community contributing to advancements in virtual multi-agent AI, expanding the frontiers of collective distributed intelligence at a pace which exceeds physical robot innovations. Although socioeconomic barriers are of fundamental importance, this is certainly not the only dimension that continues to separate progress in the RoboCup simulation versus physical leagues. Crucially, developers involved in the simulation leagues are able to focus much more effort on sophisticated multi-agent AI algorithms, making new ground in the studies of collective distributed intelligence. These developments mirror an important trend underlying AI improvements: virtual AI enclosed within computer networks can advance at a much faster rate than fully-embodied robotic AI. The reason behind this trend is simple. For an advanced robotic species to evolve, a cycle of self-improvement is necessary for both software and hardware capabilities (including perception, actuation and processing machinery). Although rapid-to-exponential improvements in AI are likely within a perpetually growing cyber-network, it is difficult to envision hardware evolving at a sufficient rate as to enable the embodiment of this intelligence within a physical robot. Such improvements are fundamentally constrained by the laws of nature, and even software improvements will eventually encounter the information thermodynamic limits of computation. 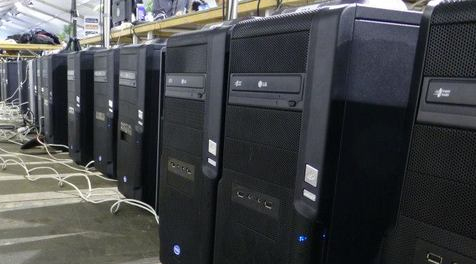 The significance of software embodied within hardware has been recognized by many researchers, including biologists. Davies observed that the chemistry of living systems can be compared to hardware, whereas genetic and epigenetic information are analogous to software. Moreover, the duality of hardware and software is elegantly reflected in the dual role of DNA, which is both the information-carrying unit of the human genome while providing a physical mechanism for this information to be read (Watson-Crick complementarity). Given this and many other parallels between natural and robotic systems, it is perhaps unsurprising that the evolution of physical robots is (by definition) subject to the same physical laws and constraints as those applicable to any other species. If virtual AI can, in principle, evolve much quicker than hardware-bound robots, an interesting question arises: can AI software be readily uploaded to robotic hardware at any given time? Insights to this question were provided as early as 1949, when British philosopher Gilbert Ryle dismissed René Descartes’ principle of mind-body dualism which assumed that the mind – unlike the body or brain – is a non-physical substance. This “ghost in the machine” analogy can be extended to describe AI: a virtual mind embodied within a distributed body (the computer network), which cannot be extracted into robotic hardware without destroying the essence of its consciousness. Although the capabilities of a virtual intelligence can grow unbounded to fill a perpetually growing network, it will not just be a software mind, but rather embodied by and intertwined with a (distributed) form – the computer network. The ghost is inseparable from the machine, which leads to a reassuring conclusion: the evolution of the robot species will continue to lag behind virtual software-oriented AI. This conclusion offers sufficient possibilities for shaping an ethical and responsible trajectory for future AI research and the eventual co-evolution of humanity and AI. Many of these paths involve technology being leveraged to augment human intelligence, either in its current form (devices), cybernetic implants, or gene editing technology. In any event, it is of fundamental importance that no virtual entity, reality or construct should become a single point-of-failure in the future prosperity of our physical world.